best quality product!! I was unhappy with the basic silencer. This is because other cars don't recognize my existence. So I recognized another silencer. But most of the silencers were very loud. So I thought about it. The silencer that fits those conditions is Moriwaki. This silencer provides excellent completeness and satisfactory sound. I highly recommend this product. this sounds very good! I recommend to the exchange from normal. I think that it is thought that a power down is exchange from a slip-on or full exhaust. Since he likes a design from the first, regret is not carried out, but it is the engine performance equivalent to nor I recommend to the exchange from normal. Since he likes a design from the first, regret is not carried out, but it is the engine performance equivalent to normal. It stands, a skid pad is bought rather than one GOKE Ung of 10,000 yen carries out, and it is cost reduction! It stands, a skid pad is bought rather than one GOKE Ung of 10,000 yen carries out, and it is cost reduction! The kana ? which can prevent the dent of a tank was thought and it has equipped. The rest is half HATTARI (smile). The kana ? which can prevent the dent of a tank was thought and it has equipped. The rest is half HATTARI (smile). 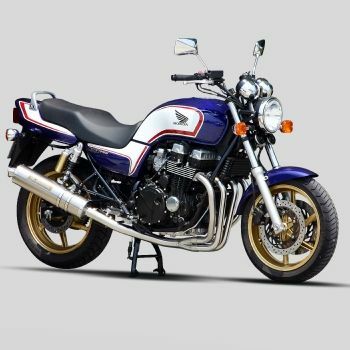 Although a tourer is put in and one year or more passes, it is changeless to the engine performance, appearance, or sound, and feels the merit of the quality of a moriwaki. In the state where it is putting in as it is without the ability to buy a main Although a tourer is put in and one year or more passes, it is changeless to the engine performance, appearance, or sound, and feels the merit of the quality of a moriwaki. In the state where it is putting in as it is without the ability to buy a main jet, as for the engine performance, intermediate speed and high-speed elongation become good. (As for a low speed, torque becomes thin a little) Since it is so quiet that the engine mechanical sound is louder if it is the feature that the low-pitched sound at the time of idling sounds and it turns, sound may be felt unsatisfactory. Although riding of a speed is good certainly, there is no dramatic change on a physical feeling. I think that total performance -- fuel consumption's not having fallen and a price are cheaper than normal -- is excellent. It has been one year or more since the tourer was put in. It is changeless for the engine performance and durability is a moriwaki truly. The comment which rode as it is without changing a main jet are the touch to which high-speed elongation beca It has been one year or more since the tourer was put in. The comment which rode as it is without changing a main jet are the touch to which high-speed elongation became good from intermediate speed (a low speed becomes thin a little). Although sound is gentler and it is the touch which sounds low-pitched sound, if rotation is raised, the direction of an engine sound will think that it is unsatisfactory to those who adhere to sound about [ large ]. It is whether although going up of rotation and the elongation of road speed have become early certainly, there is any impression on a physical feeling not much. I think that total balances also including fuel consumption are excellent. It is the touch which raises several [ No. ] main jet, which will be rich and which is likely to be extended by Kami for a while. It purchases by breakage of a normal muffler. Although it wavered with aluminum, the color was seen and decided promptly. It is an amateur of a degree very much at attachment, and is about 2 hours. 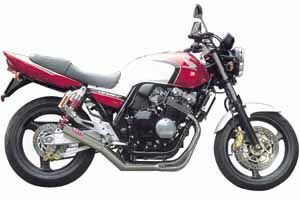 With [ although it is tone quality ] no compl It purchases by breakage of a normal muffler. With [ although it is tone quality ] no complaint! Touch like [ it is not too annoying, is not too quiet, and ] the normal of a paddle wheel. Right [ of the appearance after attachment ] is carried out, and it is 縲? Individually, it was large satisfaction. 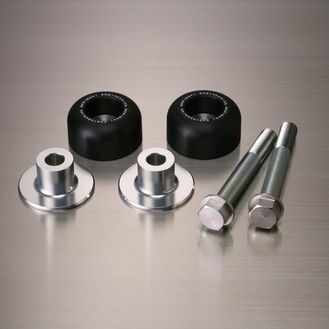 The model of the ANO silencer set additionally was purchased. Although it wavered with S-titanium of the nojima, it carried out here by the smallness of sound volume, and the low price of the price. 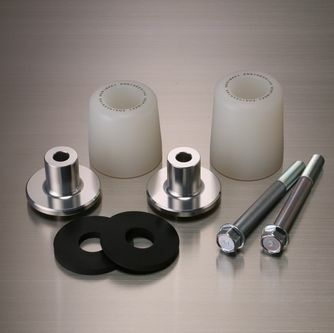 Since appearance is modest alt The model of the ANO silencer set additionally was purchased. Since appearance is modest although it will be the most pleasant motorcycle if it rides, a parenthesis becomes good for a while by the presence of a muffler. Since weight weighs about 19 kg as for a pure muffler, it becomes fairly light and an aggressiveness walk and stand credit become easy. seemingly although a quiet pure exhaust sound is not bad, either, they are 4 cylinders of air cooling -- it becomes sound good. Even if it turns, the sound volume itself is not like it, either. There is torque of enough even in a low rotation region, and the ease of riding which is the greatest virtue of RC42 does not change. Since it is a stainless raw material, it is that taking only needs to be maintained [ which can be burned these days unlike the mainstream thing made from titanium ].